This is a sponsored conversation written by me on behalf of Cricut. The opinions and text are all mine. This post contains affiliate links. I love to make wreaths for my front door and I’ve found that the easiest ones to make are with the straw wreaths you can get at any craft store or even Walmart. I love to use seasonal burlap ribbon to wrap around the wreath because it’s super simple and quick. Today I’ll be teaching you how to make an adorable 4th of July Wreath with star burlap ribbon, red tulle and white card stock for the flowers cut with my Cricut Explore Air. one roll star burlap ribbon- I bought mine at Walmart in the fabric department, but you can find some on Etsy HERE. Simple, huh? You could make a cute wreath like this for any holiday or special occasion with any cute burlap ribbon you can find. There are so many to choose from HERE. I’ve created a step by step video tutorial for you visual people. The instructions are written out for the people who like to read the directions. If you don’t have a Cricut Explore Air, what are you waiting for? I use my machine at least once a week. I use it for home decor, special occasion cards, party decorations, visual aids for teaching and a whole bunch of fun summer projects for the kids. 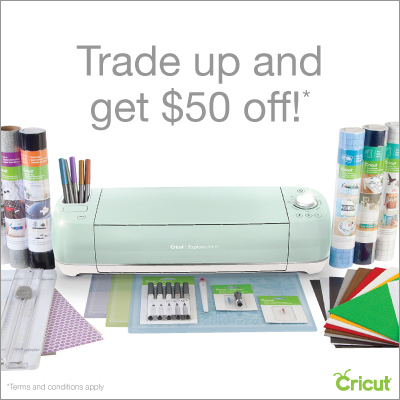 And right now you can trade in an old machine and get a $50 credit to upgrade your machine! One of the best things about using a Cricut machine is being able to use the Cricut Design Space online. There are hundreds of crafts, cards, clip art, and more to choose from. Today for this project we are using one of the 3D Flower cut files available in the Cricut Design Space. Glue beginning of the star burlap ribbon to the back of the straw wreath. Start wrapping the burlap ribbon all the way around the wreath, making sure to pull it really tight as you go. When you make it all the way around the wreath, glue the end to the back of the wreath and cut off any excess ribbon. Cut about a yard of the red tulle ribbon. Wrap it around your hand and take it off. Pinch it in the middle to make a bow. Tie the middle tightly with string. Spread the tulle to make it look like a flower or a circle. Open Cricut Design Space and choose new project. Click insert image and search for 3D flowers. Choose your favorite (I chose the large smooth bumpy one). Cut three flowers with your Cricut Explore Air machine measuring 6″, 5″ and 4″ wide on white card stock using the light grip mat. Wrap the flowers starting from the outside by twisting the paper around a bamboo skewer. Carefully release the flower to let it expand. Hot glue the end flap and the bottom of the flower to secure it from unwinding (see video). Glue the flowers to the middle of the tulle flowers. Hot glue the tulle to the wreath how you desire. Use twine to hand the wreath from your wreath hook, or any other kind of string or ribbon you choose. Viola! You’re done! Isn’t it adorable? Now go out and hang it on your door and snap a pic of it and send it to me so I can see what you designed!